Sometimes we get separated from people we’re close to, and sometimes lose touch and wonder where they went, but when it comes to a family member, it can be traumatic. I lost touch with my daughter when she was two weeks old. It was the one and only time I’d see her until… God’s Restoration! That restoration birthed a song in me that helped me navigate the journey when the connection was restored. 27 YEARS AGO. ONE FACE Lyric Video by Joseph James | When folks think of Jesus, which face do they see and what does it look like? We are created in the Lord’s image, but who do people see? ONE FACE! 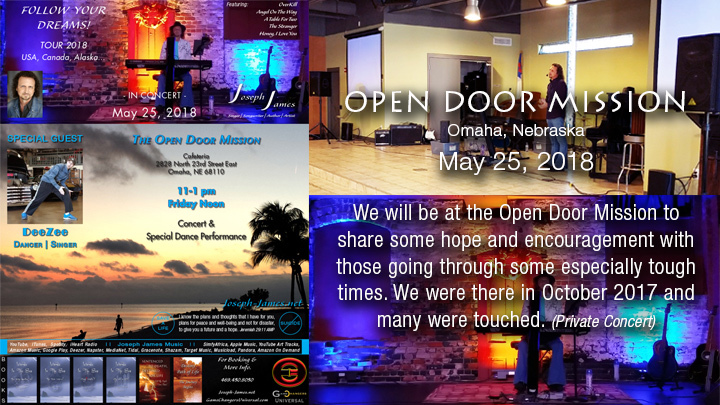 Joseph James’ will be performing at the Open Door Mission in Omaha, Nebraska on May 25, 2018 from 7-9pm. 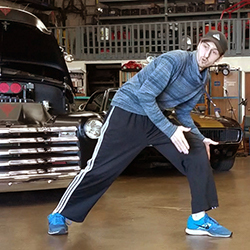 His son, Daniel Hartmann [Dee Zee] will be doing several dance performances as well. The Follow Your Dreams Tour is an entertainment outreach to help encourage people and to rekindle hope in their hearts with a focus on helping them dream again and go for their destiny. We performed at the mission October 2018 and it was great to encourage those who have lost everything and are homeless. This event is a private performance. 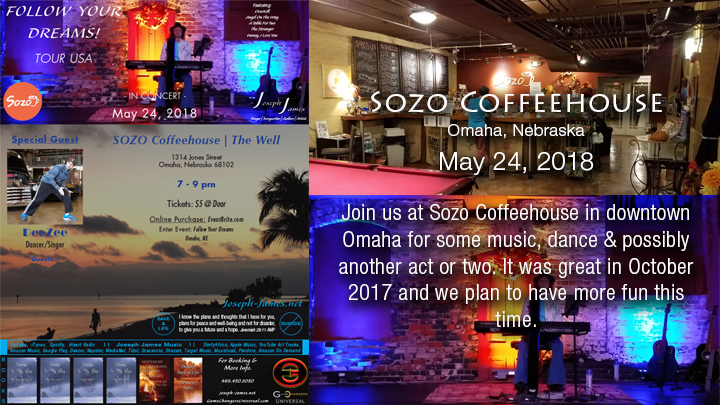 Joseph James’ will be performing at the SOZO Coffeehouse in Omaha, Nebraska on May 24, 2018 from 7-9pm. His son, Daniel Hartmann [Dee Zee] will be doing several dance performances as well. The Follow Your Dreams Tour is an entertainment outreach to help encourage people and to rekindle hope in their hearts with a focus on helping them dream again and go for their destiny. We might have special guest performers from the community. Tickets are $5 online and at the door. If you’re in the area or know of someone who is, please let pass this on. 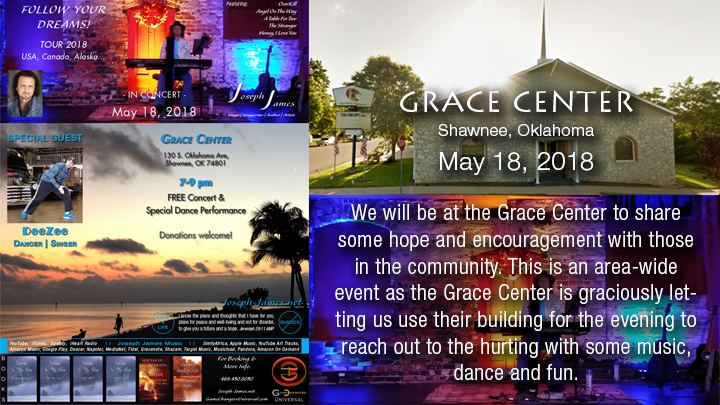 Joseph James’ will be performing at the Grace Center, 130 S. Oklahoma Ave, Shawnee, OK 74801 on May 18, 2018 from 7-9pm. His son, Daniel Hartmann [Dee Zee] will be doing several dance performances as well. The Follow Your Dreams Tour is an entertainment outreach to help encourage people and to rekindle hope in their hearts with a focus on helping them dream again and go for their destiny. 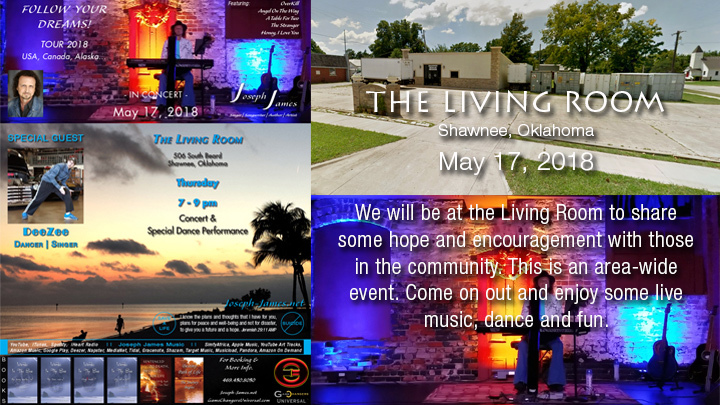 Joseph James’ will be performing at The Living Room (Shawnee Rescue Mission) 506 South Beard on May 17, 2018 from 7-9pm. His son, Daniel Hartmann [Dee Zee] will be doing several dance performances as well. The Follow Your Dreams Tour is an entertainment outreach to help encourage people and to rekindle hope in their hearts with a focus on helping them dream again and go for their destiny. If you’re in the area or know of someone who is, please let pass this on to them. 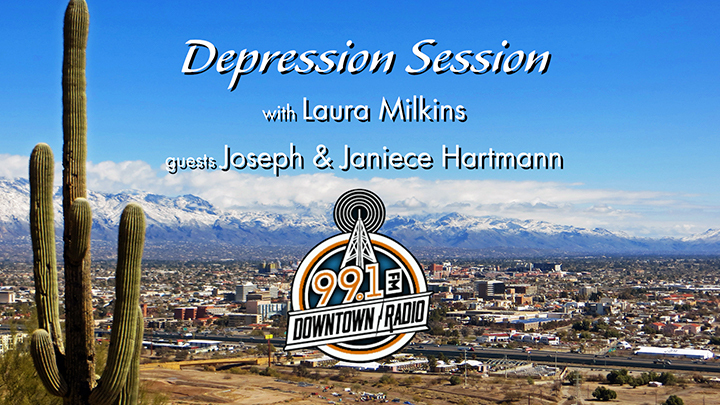 April 7, 2018, Joseph and Janiece were guests on Laura Milkins’ Depression Session Radio Show in Tucson. The show aired live on KTDT 99.1 FM Downtown Radio in Tucson Arizona. We were so honored to get to share Janiece’s testimony from her biography and Joseph’s story together as well. 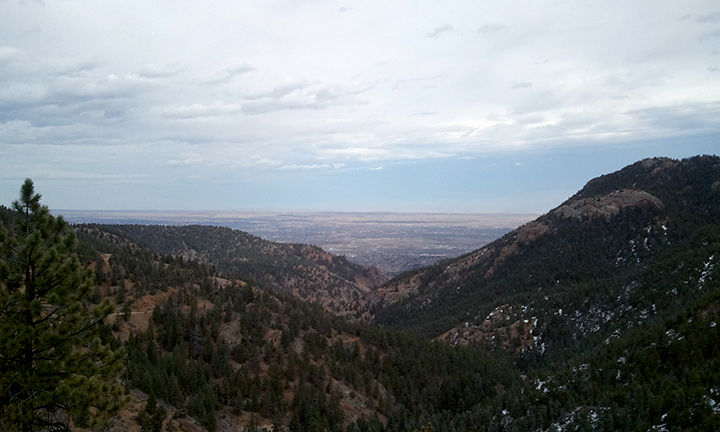 The show is also available on Laura’s site at: https://thedepressionsession.com/2018/04/10/bicycling/ We hope you enjoy the show, get challenged in areas where you need it, get healed and encouraged as well. Check it out. SPECIAL THANKS to Laura Milkins for having us as her guest on her show. 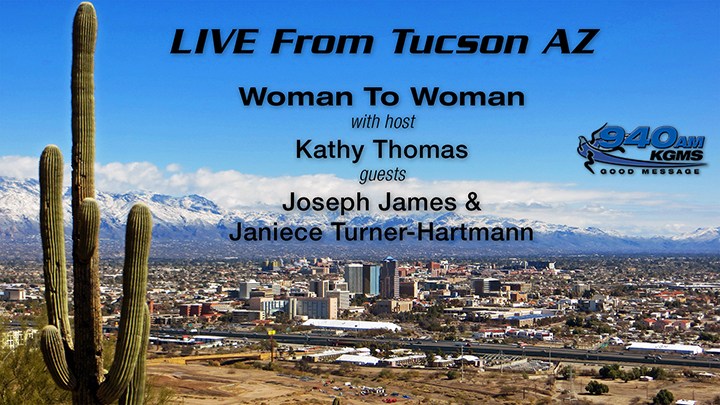 February 24, 2018, Joseph and Janiece were guests on Kathy Thomas’ Tucson radio show Woman To Woman. The show aired live on KGMS 940AM in Tucson and KNXN 1470AM in Sierra Vista, AZ. It was streamed live on the KGMS.com website and Facebook. This video is an edited version of that radio show. Catch the complete show at the radio website above. We were so honored to get to share Janiece’s testimony from her biography and our story together as well. We hope you enjoy the show, get challenged in areas where you need it, get healed and encouraged as well. Check it out. SPECIAL THANKS to Kathy Thomas for having us as her guest on her show. Blessings and thanks for watching. Please use our contact page for bookings and or to contact us. Hope to see you down the road somewhere. Go for your Dreams! Follow Your Dreams Tour 2018. CHECK OUT the book, the videos, and all the other things we’re doing on our two websites, Joseph’s music and other books as well. Our itinerary is up on the Joseph James website as well. GET JOSEPH’S MUSIC HERE: https://www.youtube.com/user/jjhdestiny You can also find Joseph James’ music on iTunes, Google Play, Amazon, iHeart, Spotify and more, 2 albums and 16 songs. The following is the Foreword from Dennis Goldsworthy-Davis, minister of Open Wells Ministries, for Janiece Turner-Hartmann’s story, Sentenced To Death, Destined For Life, written by Joseph James. Please help us get this story to go viral as it will help many folks who are dealing with many of the issues Janiece lived through. Suicide is such a huge problem in our society, and we want to share the gift of life and encouragement so that folks will choose to go for their dreams no matter how hard it seems. We can all make it if we just don’t give up.